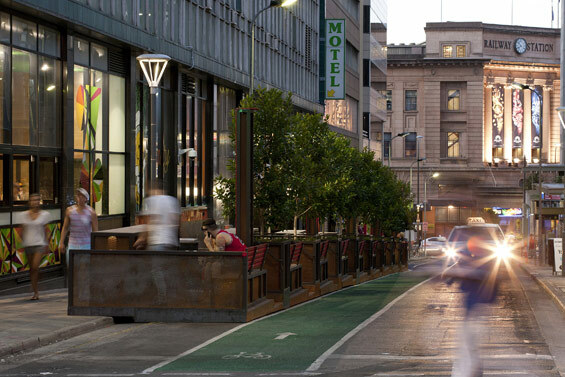 The Bank Street Parklet project is a significant development contributing to the laneway links of Adelaide recognised by Jan Gehl between the River Torrens / Adelaide Oval and Central Market/ Victoria Square precinct. With over 12,000 pedestrians a day and vibrant activity in the evenings and early mornings, the project dreamed of an innovative solution with new public amenities inherent of high urban design values. The design would be robust, durable, and flexible in its application to meet a difficult sloping topographic context. As a revitalised shared street it would unify a complex array of contradicting standards and approval guidelines. 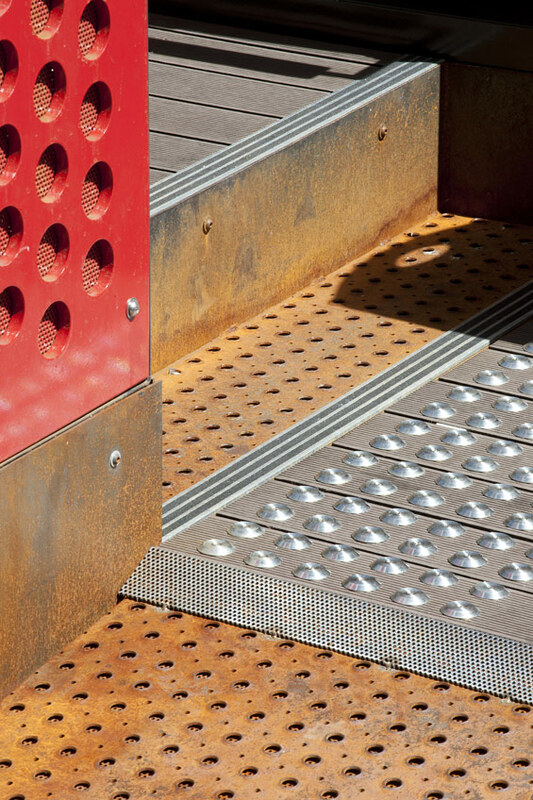 The project began with extensive consultation which informed modular and durable Parklets were designed to effectively provide kerb extensions minimising the modification of existing infrastructure. 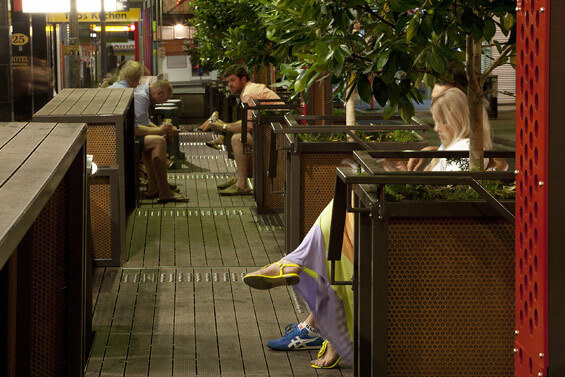 The Parklets themselves provide access from either footpath, a mixture of seat and bar configurations requirements, advanced tree plantings for amenity, shade and privacy, soft lighting in the evening and above all a sense of spaciousness. 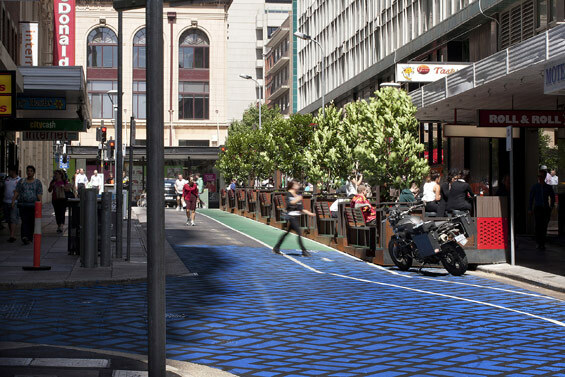 The change of the roadway corridor to a one way chicane based road with contraflow bike lane, raised crossover and road supergraphic at a key pedestrian crossing transformed the street into a vibrant, activated, pedestrian-friendly environment. 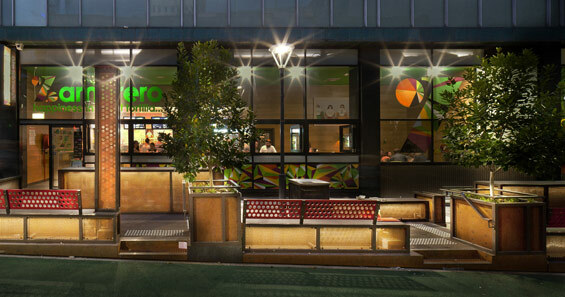 A creative and exploratory design approach with a deep and thorough understanding of Australian Standards, Building Rules, DPTI traffic guidelines and approvals, ACC guideline approvals and DDA compliance led to a design that challenged each organisation individually and maintained a quality design intent. Following extensive consultation with traders and all key stakeholders, modular height adjustable Parklets with planting, lighting and a variety of seating types were proposed. Installed as kerb extensions, the design reconfigures the traffic arrangement with a narrowed vehicle lane. This combined with a trial contraflow bike lane, CCTV and lighting upgrades, reduced parking, raised pedestrian crossover, new public art and a new road supergraphic led to a transformation that gives greater equity to pedestrians and community amenity. 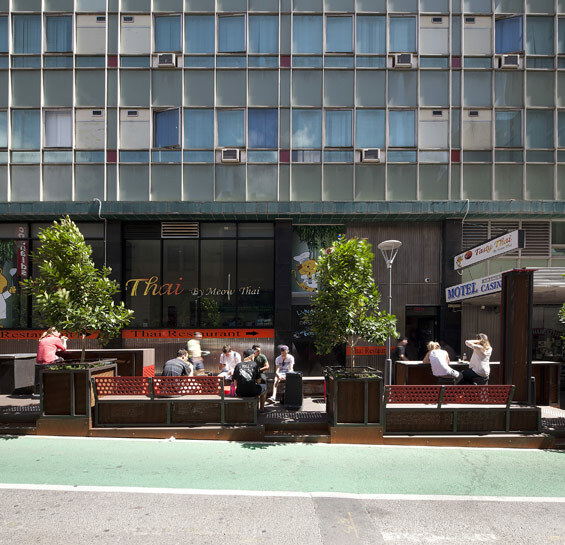 Beyond the built form, wonderful social outcomes of the project are evident with new ownership of space and partnerships generated between street traders operating Parklets. 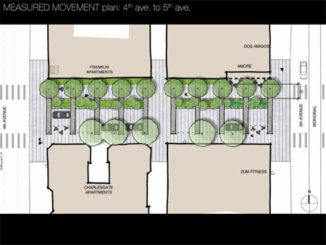 The conversations and additional trade generated within the Parklets presents a formidable justification for the project. Due to deadline pressures the design and construction occurred with in a very tight time frame of four months with full site installation in just 6 days providing an instant and radical street transformation. 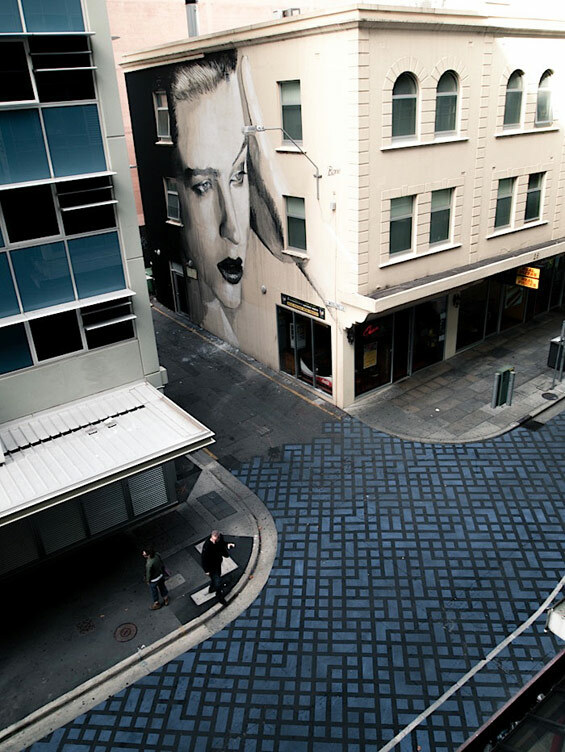 This project sets a new benchmark for its ability to trial new street configurations without major civil works. Best practice techniques were required to collaborate and consult individually and collectively with consultant professionals, statutory authorities and the street traders. The result is a seamless integration of furniture elements, lighting, planting, efficient modular construction and flexibility of the built design for individual or multiple use applications on sites with varying topography. 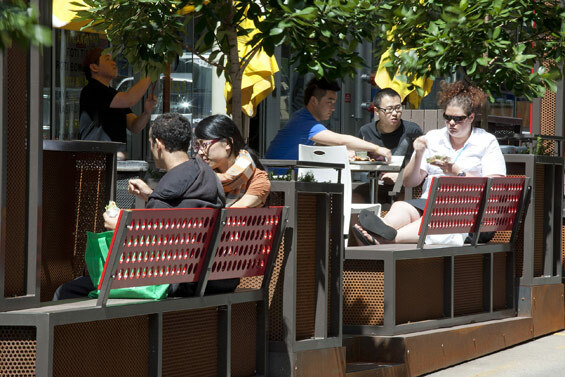 The Parklets themselves have provided significant new social and economic opportunities for the traders and community, offering a space for conversation and an extension to existing outdoor dining areas. 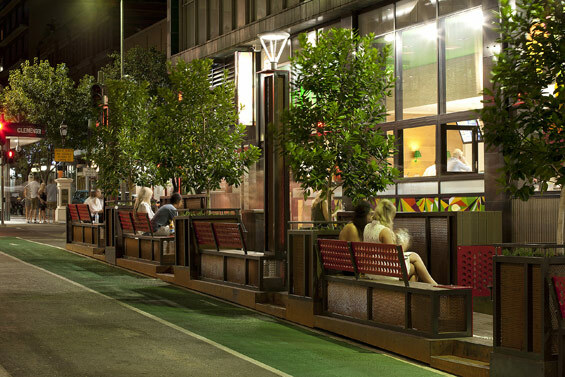 The ease of access into Parklets from both sides of the street and from one Parklet to the next provides a sense of spaciousness, while accommodating disabled access. The simple ‘splash’ of colour and restrained use of robust materials provides consistency and a sense that the street has a common suite of furniture. 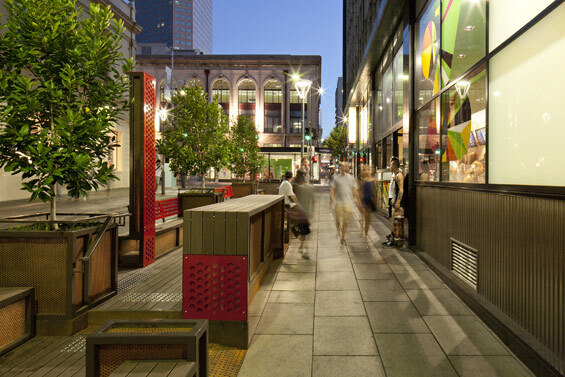 The topographic nature of the site and variety of seating types provides a dynamic visual aesthetic as the Parklets terrace themselves down the street. 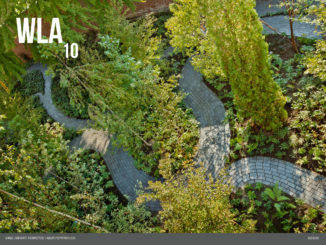 As a testament to the design and leadership of TCL, the resultant outcome was carefully devised to address contradicting approval processes for Australian Design Rules (traffic), DDA, Building Code, Australian Standards and local council policies giving a built outcome embraced by all individual governing authorities. How much is your local park worth?